Figure 10-9.-Example of a variable volume, stroke reduction pump with variable cam plate. valves. These valves are usually set at about 15 psi; this ensures circulation of fluid in the pump. The piston pump discussed is a constant displacement type; that is, for any given rpm, the volume output is constant. However, there is another version of the piston pump used more extensively than the constant volume pump; that is, the variable volume pump. Variable Volume Piston Pump. - There are many versions of the variable volume pump; several different control methods are used to vary the fluid flow through the pump. 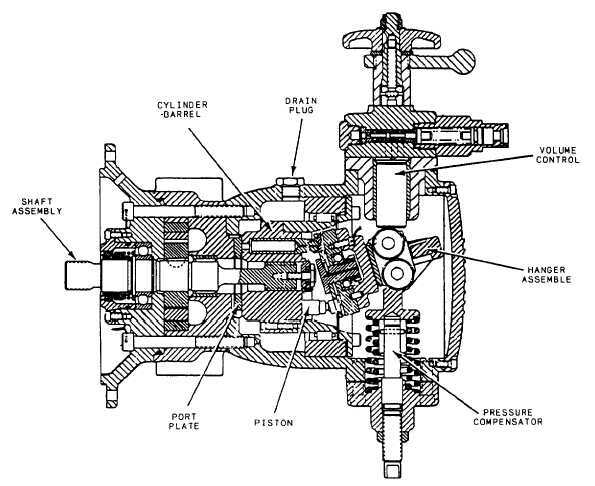 Some of the pumps vary the volume by controlling the inlet fluid; some vary it by changing the angle between the pump drive shaft and the piston cylinder block; others by using a system bypass within the pump to vary volume output. One advantage of the variable volume pump is that it eliminates the need for a system pressure regulator. A second advantage is that it provides a more stable pressure, thus reducing pressure surges and the need for a system accumulator; however, they are retained for use during peak load occurrences. 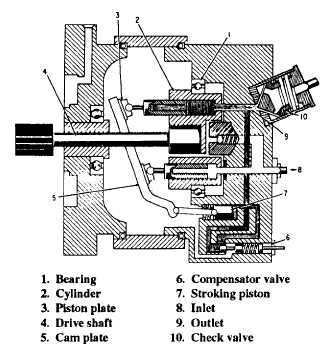 Figure 10-10.-Variable displacement axial-piston pump.